Knitting With a "Y": The Accounts of a Male Knitter: I Won! 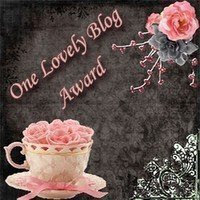 Ok, I didn't actually win anything, I was just nominated for a One Lovely Blog Award by my sister, ClumsyKnitter. Thanks sis! 1. Criminy Jickets - I don't remember how I was first introduced to this blog. I'm assuming it was through ravelry, and I was curious what other male knit-bloggers were writing about. If it weren't for Dave being so patient with me and answering all my beginner questions about spinning, my spindle would still be used strictly for decoration and my fiber would be used for stuffing. His spinning is all so beautiful. Thanks Dave! 2. How The West Was Spun - Anne's blog is one that I only started reading quite recently (well, a few months ago at least) and as I've said before, I love reading about what she's doing with her life. She was kind enough to recently send me some lovely spinning fiber (see previous post) and I am constantly inspired and motivated by both her spinning and her knitting. There seems to always be something exciting happening down there in New Mexico. 3. Mamafitz - I've been following Mamafitz's blog for a while now, and I thoroughly enjoy it. I'm not sure what it is about her blog that draws me in. I think it's her love of being a mother and her total devotion to her children that just makes me happy when I read her posts. I can tell that she's having the time of her life with her kids. 4. Marginalia of a Habitual Addict - Reading Knitwick's blog is totally a look into a completely different realm of life than the one in which I live. As someone who tends to simply "go with the flow," I find it extremely fascinating to read a blog written by someone who likes planning, and structure, and has a place for everything. He is currently recounting his recent visit to Japan in a very neat, orderly, extensively detailed (as he undoubtedly kept a journal while he was there) manner and I love every minute of it. I feel as if reading his blog makes my life more structured. Is that possible? 5. The Happy College Knitter - This blogger hails from Wisconsin and, like me, is currently in college. We've even met a few times at my LYS because, get this, it's one of her LYSs too! She was one of the people that really encouraged me to start my own knitting blog. I love her pictures and think she is tremendously creative and fun. 6. WhitKnits - This is one of the first knitting blogs I started reading. In fact, I have been reading her blog for over a year and a half now. I discovered Whitney's blog during a time when I was suffering from a great deal of insomnia, and when I found it, I loved it so much that I went back to the very beginning and read every single post - it proved to be a great comfort and companion through those long nights. She is also a very talented knitter, wonderful writer, and to top it all off, she plays the violin! Ok, so I chose six blogs, big whoop. I'm just spreading the love. Adieu! I'll have to check out some of your faves. And get this: I can tell you had a long weekend because you seem to be commenting on all my regular blog reads right before I get to them. Too creepy! Why thank you, sir - very kind of you! Nicely considered. Nothing that a blogger likes more than a little kudos (well, free luscious fiber is also good). You make each one feel ripe for the picking! oh my! thank you! now i feel a wee bit guilty that i've been lazy in my blogging (but just a wee bit). now that spring is here, the garden is demanding my attention, so maybe i'll get some plant posts done. Aww, thank you! Such a nice thing to read as I'm coming out of my finals-induced blog-reading hiatus.